The above strips of exceptional photos were a gift from Mike at Mike’s Look at Life blog. Although these are from the era just prior to the invention of the dip and dunk photobooth machines, for which I have such a passion, Mike knew the format and subject matter would appeal to me a lot. They date to around 1910 to 1925. These people are playing against the formal portrait conventions of the time, by mucking about, much as one would do in a modern digital photobooth. 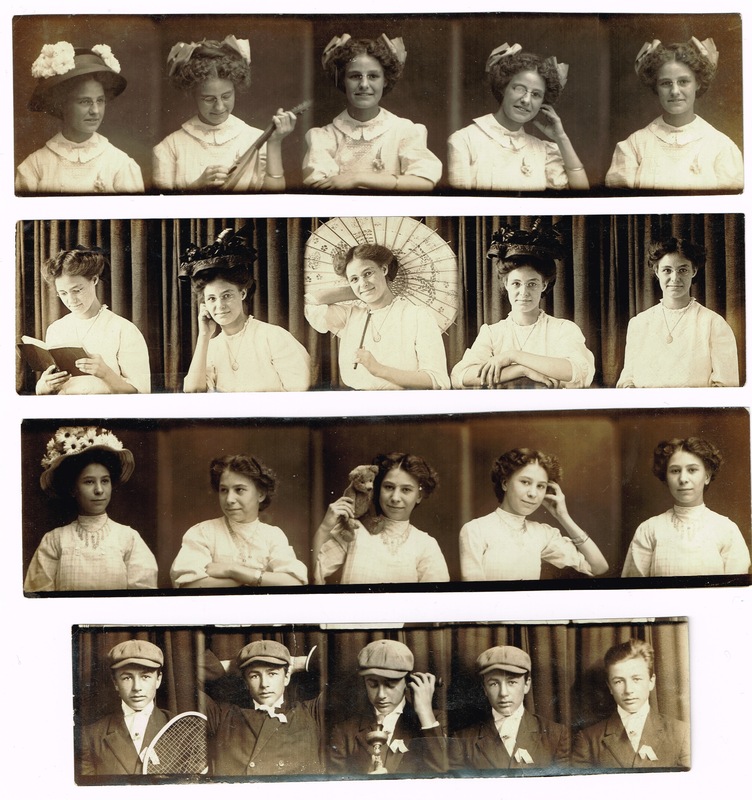 These penny photos were a precursor to the automatic photobooth machines invented by Anatol Josepho in the late 1920s. Although still needing the skill of a photographer to make the image, the developing and processing of the strips was semi-automated, allowing for the first time, very cheap prints that most people could afford. I love all of these photos but my favourite changes every time I look at them. Today my most loved, is the one featuring a battered old tennis racket, which was obviously a photographer’s prop. It ties in nicely with a recent post on my other blog, Photobooth Journal. You can see that post here. My heartfelt thanks to Mike for his generous gift and his friendship. You can click on the scan to see a larger version, if you’d like.